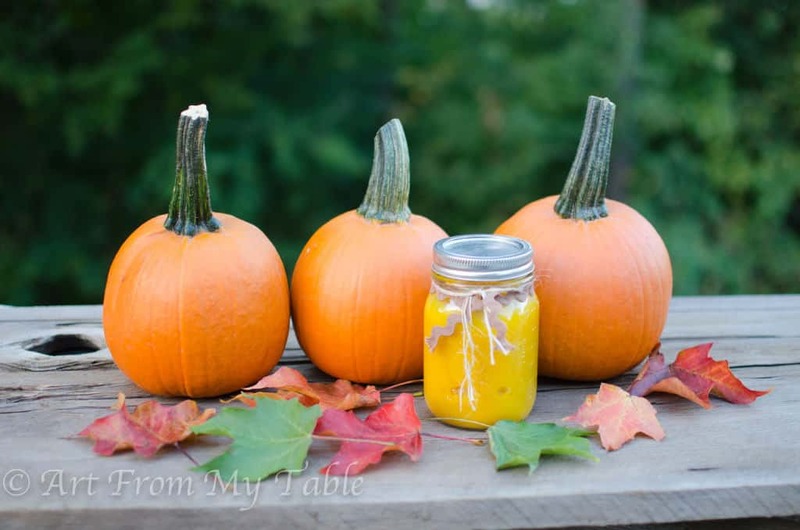 Making your own Pumpkin Puree is easier than you think! With so many pumpkin recipes this time of year, stock your freezer with homemade pumpkin puree and you’ll be set for that Pinterest inspiration. 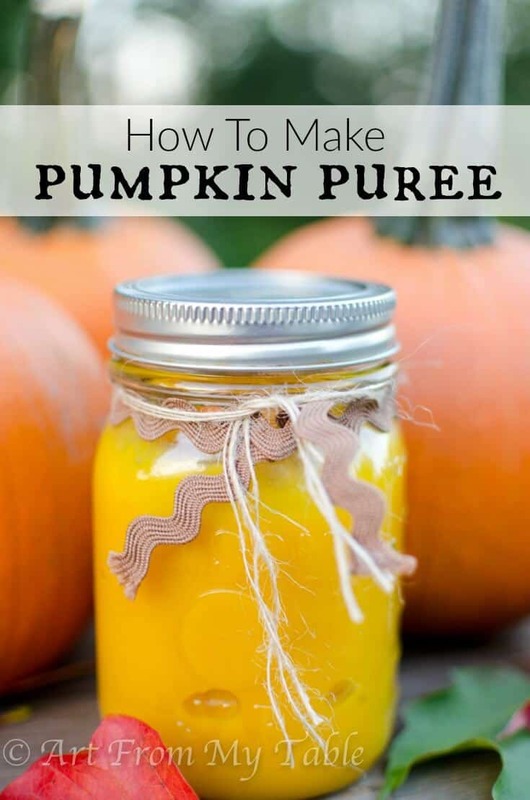 I have been making my own pumpkin puree for awhile now. Once you do it, it’s so hard to go back to the canned stuff! I always bought ‘100% pure pumpkin’ when I bought it canned, but this? Oh my! It is 1000 percent better! It’s not hard to do either, It takes under an hour to roast the pumpkins. If you set aside some time on the weekend, you can roast and freeze those babies and you’ll be all set. What? Freeze it? YES! Stock that freezer and you’ll be off to pumpkin muffins, pumpkin pie, pumpkin roll oatmeal, pumpkin shakes, pumpkin appetizers, and so much more! You will be prepared for all those Pinterest inspired recipes. Oh, and don’t forget about the seeds! One of my favorite fall snacks. Really hits that spot for needing something crunchy and salty. And there’s so much you can do with seeds alone!! Sweet and spicy, smokey, classic, cinnamon, the options are endless. Do you have a favorite? Check out this pumpkin yogurt with cinnamon and sugar seeds. 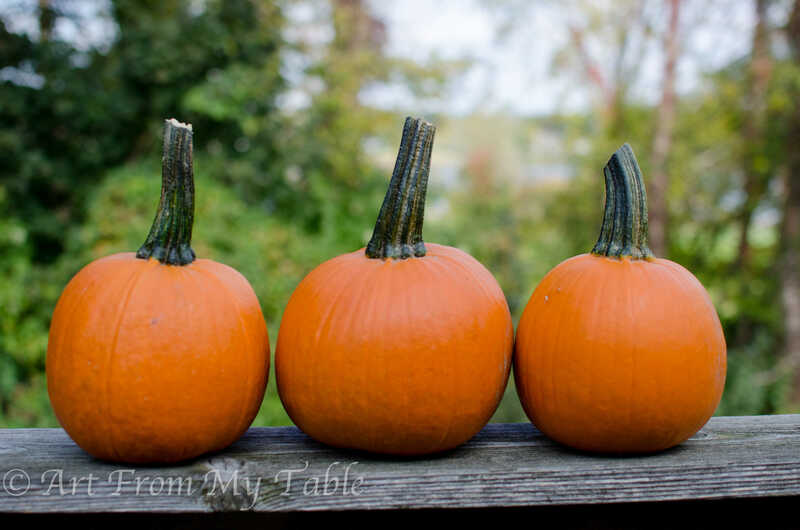 Crack open that pumpkin~ Make sure you are using a pie pumpkin, also known as a sugar pumpkin. I love to get mine from the local orchards. Scoop out the seeds and reserve them for a tasty snack. Bake~ Place the pumpkins on a baking sheet flesh side down. Bake at 350 for 45-60 minutes. It should be fork tender and the skin peels right off. Blend~ Once it’s cool enough to handle, scoop out the flesh of the pumpkin. Put in in a blender, such as a Vitamix or food processor, and blend on high until it’s puree. All done! Now you can use it immediately or freeze it!! After freezing and thawing, it may be watery. just strain it in cheesecloth over a bowl. Doesn’t it just even look so much fresher? It’s orange! Like a pumpkin! Not brown. Just sayin’. 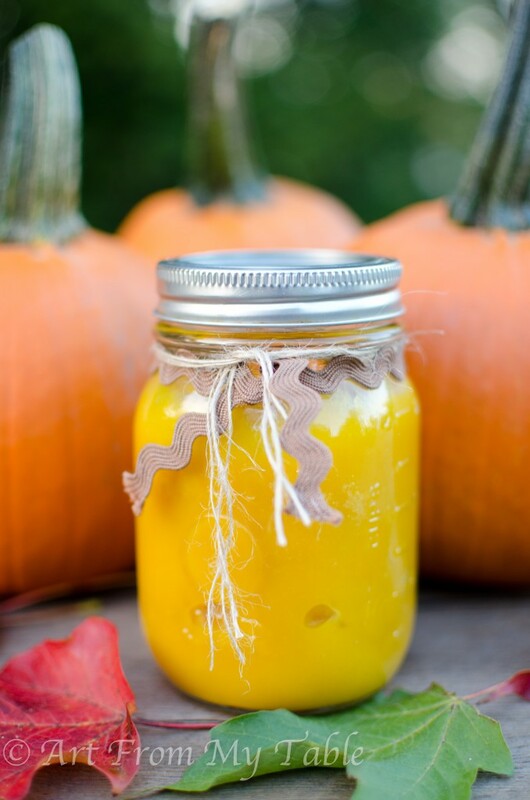 Once you make your own pumpkin puree, you may never buy canned again. It's easier than you think and you can stock up and freeze it for all your pumpkin inspirations! Remove the stem and cut pumpkin in half length wise. Scoop out seeds and pulp. Bake in a 350 degree oven for 45-60 minutes. It should be fork tender. Remove from the oven and cool until you can handle it. Scoop out the flesh and place in a Vitamix, blender, or food processor, and puree. Use immediately, store in the fridge for a week, or in your freezer for 6 months. After freezing and thawing, it may be watery. Use cheese cloth over a bowl and let the water drain out before using. This is optional, depending on what you are using the puree for. 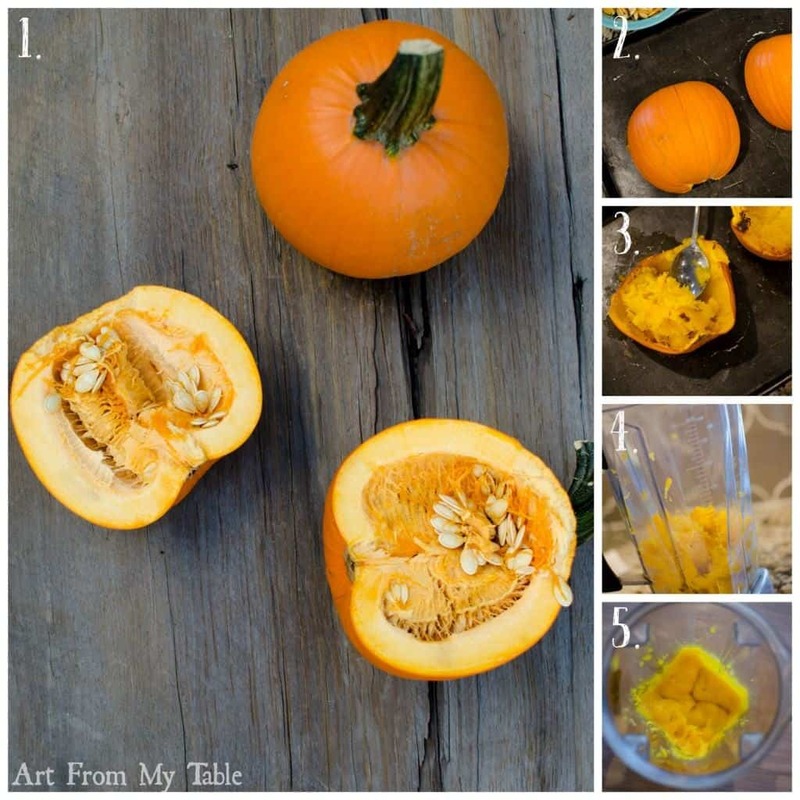 My first thought when I saw the picture was – “That is what pumpkin is supposed to look like!” Thanks for linking up on the Creative K Kids Tasty Tuesdays Linky Party. I hope you will join us again next week. I had no idea it could be done this easily! Thanks for sharing Chellie. And your pictures look great!! Next year I am going to try this! It looks so good and fresh and healthy! When you freeze it do you do it in your mason jars? How long does it last? Pinning so I can use your directions, I had no idea how to do this! Thanks. You’ll never go back! You could freeze it in a mason jar, but I typically freeze it in a quart size freezer bag. Then you can lay it flat in your freezer, and it takes much less time to thaw. Make sure you measure it and write that on your bag too. Most recipe’s use ‘1 can of pumpkin’, so I like to freeze mine in 2 cup portions. Great question, thanks. Wow, that looks easy! Thanks!